Last week we started a pilot to use Scrum for education, based on the eduScrum-initiative and the Agile Education Compass. The pilot is part of a research project to find out how Scrum can help us integrate 21th century skills with bachelor ICT and media education. Time has flown fast and this is what we learned so far. The pilot is performed in two ICT classes (and two non-scrum classes for the same course in parallel that we can use as a control group) and 2 media classes. Due to the exam schedule the ICT classes just had one session (3 hours) to learn the rules and the process, the media classes took some more time: three sessions during the first week. Looking at the results after one week one session seems to be sufficient to work with Scrum, but we are interested to see if a longer (calmer….) introduction pays off in the long term. The flap is the one single stop for planning, quality and learning. We insist on using a big paper flap instead of a digital planning board because creating the physical flap is a great team building activity. We also want to teach the teams to take responsibility for something small but precious before being responsible an a larger scale. The team is responsible for creating the flap but also for the availability of the flap in the classroom, no flap = no status. Taking pictures of the flap on a regular basis appears to be a nice backup plan. To explain the why of the paper flap to the teams I used the example of my kids taking care for the rabbits: they first need to learn how to take care for the rabbits before we consider taking a dog (taking care for a dog takes more time and dedication, I wouldn’t dare to say that dogs are more valuable that rabbits 😉 ). We have the luxury of teaching the class four times a week for a session of three hours with a sprint duration of two weeks. 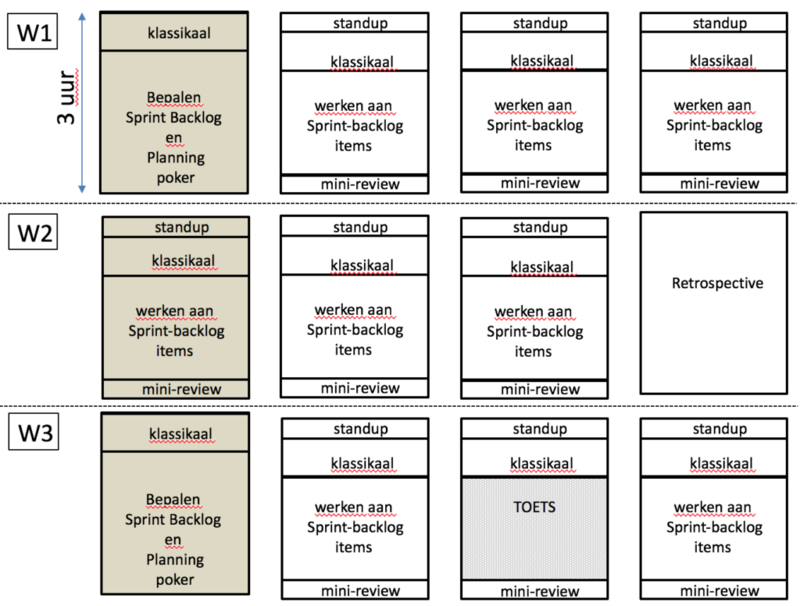 Sprint planning (Dutch). “Klassikaal” means classroom training, “Toets” means test. The tanned boxes are coached by a social skills expert, the white boxes are coached by a software engineering expert. Every session starts with a short introduction of a new subject, followed by the stand up meeting and a two hour time box for the team to work on tasks. When you watch the schedule more closely you see we originally planned the stand up meeting before the classroom training, but that required too much context switching for everyone so we changed our process. The sessions ends with a short retrospective on the session: what went well? what can we do better? any learning impediments? It enables students to inspect and adapt but also enables us as teachers to reflect on the session. Instead of a course evaluation at the end of each period (8 weeks) we have 32 small evaluations: a simple way of continuous learning for students and teachers (we prefer the word teacher to lecturer although lecturer is more common at a university). 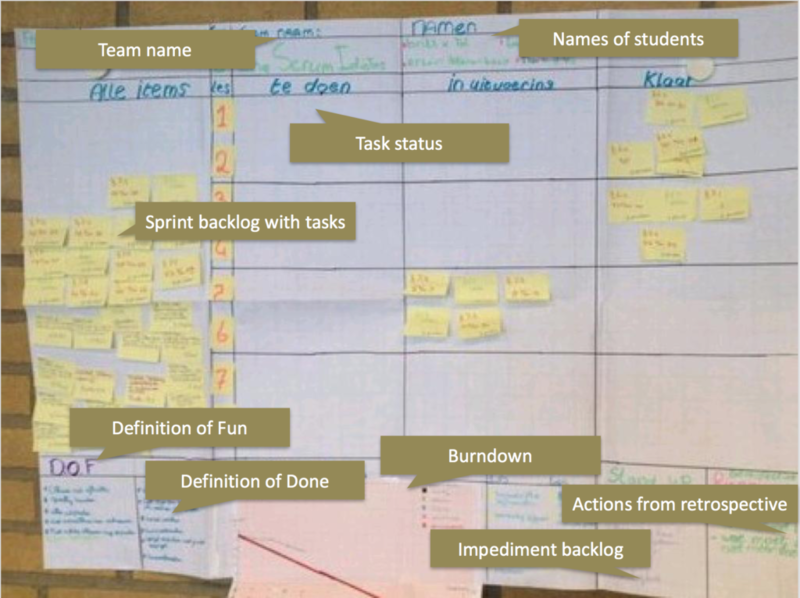 In Scrum it is very common to use user stories to group tasks. Although eduScrum uses a single level of tasks we decided to add an extra level based on user stories. It helps us to introduce a new subject (or theme) every session and describe a single story for every subject. For the first and second sprint the stories and acceptance criteria are predefined by teachers, for the following sprints the stories and acceptance criteria need some extra detail and specification by the teams. what is the learning objective, subject or theme? why is it necessary to learn this specific subject, what is the purpose? when is the story ready, what are the acceptance criteria? As a student, I need to learn <learning objective = what> so that <learning purpose = why>. For example: “As a student, I need to learn Maven so I can automatically build, test and run applications with a script”. Just like a normal user story a learning story comes with a specific set of acceptance criteria (the when). Student is able to use Maven on the command line to run, test and package a small Java application. Student can use an IDE like IntelliJ or Eclipse to import a Maven project and build a small Java application. Student does not have to know how to use Maven in a multi module setup. Because of the short time we had for introducing Scrum we decided to use plain old planning methods (e.g. work breakdown structure and the critical path) for the first sprint and learn planning poker (or other methods to interactively estimate work) later. Looking back, we also had the advantage for students to apply well known methods that helps students to learn Scrum more gradually instead of all-in-one. The choice was a pragmatic one, but for now everything turns out to be fine. By attending the stand up meetings and following the flap, the teacher decides when, where and how to help. Next week the teams end their first sprint with a sprint retrospective and a individual test (in my course a programming assignment about Maven, Unit Testing, Exceptions, Threading and Remoting). We learned a lot in just one week, so why not learn just as much in another week? Another week = another blog! Dit bericht is geplaatst in eduscrum, eduscrum, scrum, scrum en getagd eduscrum, oose, scrum . Bookmark de link .